So, if for no other reason, go to Coco for the visuals. Not just because there is a lot of (Ciwt) pink. 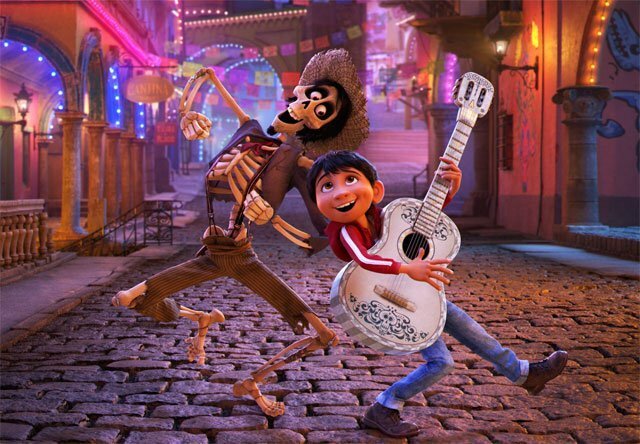 They are vibrantly alive fine art - so captivating Ciwt would have eagerly watched every frame even if Coco didn't have a story line. But it does, one that sneaks up on you before you realize how deeply touched you are. Then go for the voice acting. The charmingly handsome Gael Garcia Bernal is charmingly handsome even as a skeleton's voice. And a twelve year old boy (Anthony Gonzalez VIII) does a great job voicing a twelve year old boy - when so often animated movies use women to voice young boys and girls. Benjamin Bratt is excellent as are all the members of the cast. (Kind of hard to capture in the dark but the kids ran up onto the stage and began dancing around. All the grown ups, including Ciwt, were standing around watching and taking pictures. So unexpected and heart-warming). *For people wanting to budget their time and only see excellent movie making be warned there is an unannounced and (as one viewer said) 'utterly asinine' 20-minute Disney short before Coco.